It’s time for another SUO challenge and this time our theme is Geometrical Shapes. Now I guess that could mean either the card is a geometrical shape or that you can use geometrical shapes on your card. Hmmm….can you guess which way I took it to mean? I’ve mentioned before how much I enjoy this new set – What’s Your type?. It is filled with just that …geometrical shapes so you can really have fun creating unique ‘backgrounds’! Whisper White – 3 x 5 1/2. Stamp the large solid circle Crushed Curry, diagonal lined triangle Smoky Slate, chevron Memento Black, small solid circle Real Red. Now cut this into strips. I did 1″, 1/4″, 3/4″, 3/8″, and then the last piece is 5/8″. 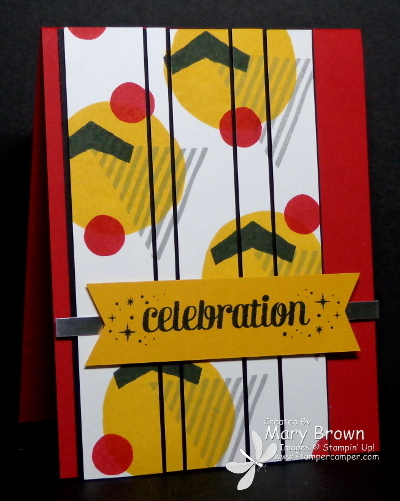 Add dimensionals to the back of each strip and add to Basic Black – 3 7/8 x 5 1/2 and add to card front. How simple is this? I love the look of the geometrical panel cut into thinner strips. This entry was posted in SUO Challenge and tagged Remember This, What's Your Type. Bookmark the permalink.